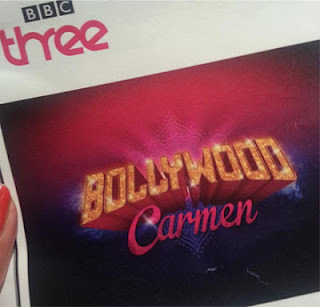 Next week the BBC are putting on a Bollywood version of the opera show Carmen. The event will be taking place live in Bradford City Park and will also be screened LIVE on BBC Three. The star of the show is former Eastenders actress Preeya Kalidas and it also features Bollywood actor Abhay Deol who seems to be playing himself! As Preeya says in the video, her outfits will be designed by Strictly Come Dancing's costume designer. I always thought there was a bit of a Bollywood feel to some of the Strictly Come Dancing outfits I've seen on past series so it will be interesting to see what the designer comes up with. Meanwhile, the other cast members including Abhay Deol will be wearing outfits from local asian fashion boutique Ranis Bradford. Ranis will be providing outfits for Abhay and I'm really pleased to hear that they're also providing a bridal outfit and a groom's outfit for two of the other cast members - every Bollywood show needs a wedding! I'll be blogging more about the asian fashion in this show after it's been on tv, but in the meantime you can watch a video trailer here. The show will be live on BBC3 next Sunday, 9th June at 9pm!